Every time EB sends me a Web site to check out for our Site of the Week pick, I cringe. You have to remember it takes a long time to write this newsletter (and a long time to read it) and when I get a site suggestion from EB, I almost always have to feature it as our Site of the Week or she gets surly and treats me poorly; sometimes she even beats me. But I also know, that whatever site pick she suggests is going to be good for one thing — entertaining and fun, but that means I waste too much time “checking it out”. But this week she surprised me. She actually suggested a site we can all use…especially those of you who buy online and wonder about the trustworthiness of the site from which you’re buying. Her site suggestion this week is Scamadviser.com and it’s no waste of time. It is fast and easy to use and gives you important information you need whenever you’re about to make or considering making a purchase from a site you’re not familiar with. All you have to do is enter the URL or name of the site and click the “Check it now” button and you’ll get a ton of information about the site and a recommendation as to whether the site is safe to buy from or not. 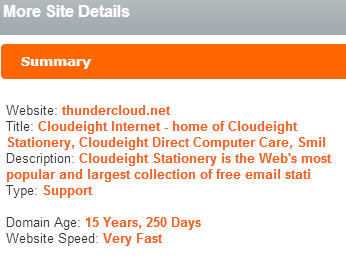 Just to make sure this site actually worked, I decided to check out Thundercloud.net to see if Cloudeight is a safe place from which to buy things. Yessssssssss! We are safe. Please buy something from us! We are SAFE! Lots of visitors but few buy anything. We’re safe! We’re broke! I can’t fathom how we’ve stayed online for nearly 16 years. I guess when Microsoft killed our stationery site with their decision to remove a viable email client from Windows, our income has gotten smaller…much smaller. But EB makes a great gruel and she ships me 8 pounds a week – one pound per day, two pounds on Sunday – and so we both subsist almost entirely on gruel and oyster crackers — they’re only 98 cents for a decent sized bag at Walmart! It’s all we can afford. You can be a booster and maybe next week she will send me a fish? I’m so tired of eating gruel. And we’re SAFE to buy from, did I tell ya that? See? We’re safe I tells ya! “Scamadviser.com is a FREE website allowing people to quickly check a website they are about to buy something from. Allowing online shoppers to find out those facts they really should know before using their credit cards. EB has come through this week with a winner and not a time waster. This site is useful…I will have to see if she has a fever or has otherwise suffered mental issues. While I’m checking EB for fever and mental aberrations, you should be vesting http://scamadviser.com/ and checking out the sites you are considering buying from. It further explained that WOT uses third party blacklists to warn users about technical threats such as viruses and malware. Since you guys recommend this site, I am absolutely inclined to trust it but I just wanted to double check this with you first. Please advise. We highly don’t recommend WOT. WOT is useless and has been for a long time. Please read this, and this, and this, and this regarding WOT. WOT lost its credence years ago when the allowed a few thugs to auto-vote thousands of times against sites which were perfectly legitimate. Some of these people, seem to have no life at all and so get their kicks by manipulating a once valid system. WOT is 100% worthless, unreliable, and may, at times, be dangerous. Be careful — one thing you never want to do is trust WOT. A friend looked up ratings on the site and they do not seem very favorable, and many felt it is a scam. How reliable is it really? I knew this about WOT too, but continue to use it thinking possibly a little warning is better than no warning. Perhaps that is not the truth. In any event, after your answer I did go ahead and enter the site and have it bookmarked to use. Do you feel the same about Site Advisor? this was a good site.I checked it out and am satisfied.I even bookmarked it for future reference. I just googled Scamadviser.com and got a whole page referring to this site as a scam!! If you google Microsoft you will read how they place a chip inside your computer so the NSA can track you. Google Google and you will learn that Google does all sorts of malicious things and collects data from you that it doesn’t disclose. Google 9/11 and you’ll learn that George Bush was behind it; Google JFK Assassination and you’ll learn Oswald didn’t pull the trigger. People can write anything they want, but you, my friend, have to use common sense. Scamadviser does not sell anything, they don’t offer any downloads, so how in the world are they going to “scam” you. There are so many real scams out there, please use good common sense before you believe people who don’t have a life and get their kicks running down whatever they can or starting conspiracy theories. Your comment worries me, but now about Scamadviser — it worries me that you didn’t even look at the site. What are they trying to sell you to scam you with? What do they want you to download. The answer to both is nothing. So how are they going to scam you. Please be careful out there — don’t believe everything you read. Why don’t you charge everybody a mere $10 or $20 a year for your site? It would help you out of a financial crunch… I will make it as a donation, but it is so little for such a goo site…..
Because we already lost about 200,000 when Microsoft took Outlook Express and Windows Mail away and all our stationery traffic dried up. We want to keep those still coming to keep on coming and hopefully some of them will buy something from us from time to time or make a gift (donation).